This is the model of doubles - from the double entry doors to the double bunk beds. 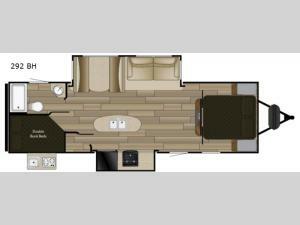 There are also double slide outs on this Sundance Ultra Lite 292 BH travel trailer. In the kitchen you will enjoy plenty of room for meal prep with the three burner range, refrigerator, plus there is an island with a double sink. Along the outside you will find an exterior kitchen with a two burner range and a sink so now you can spend more time outdoors with your family while preparing your favorite meals!